Many of the Goggin ancestors who lived in London were Watermen and Lightermen. This is a trade that was often passed down the generations because, to work on the river Thames, one had to be licensed which required a seven year apprenticeship under a master. 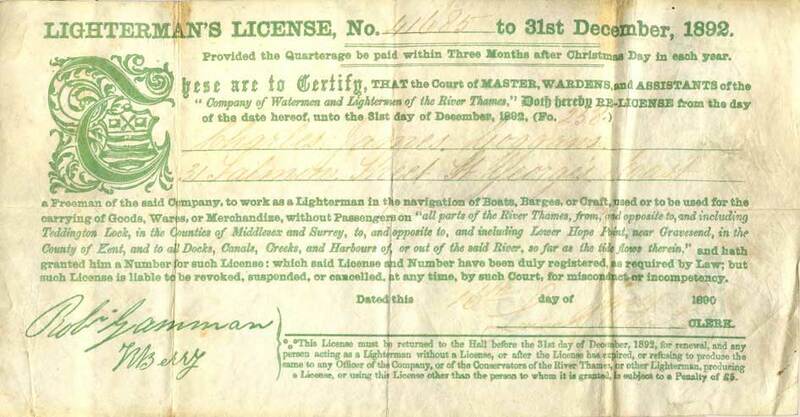 A Waterman was someone licensed to navigate and pilot passenger vessels on the River Thames and a Lighterman worked on barges, carrying goods or wares up and down the river and from cargo ships to shore. 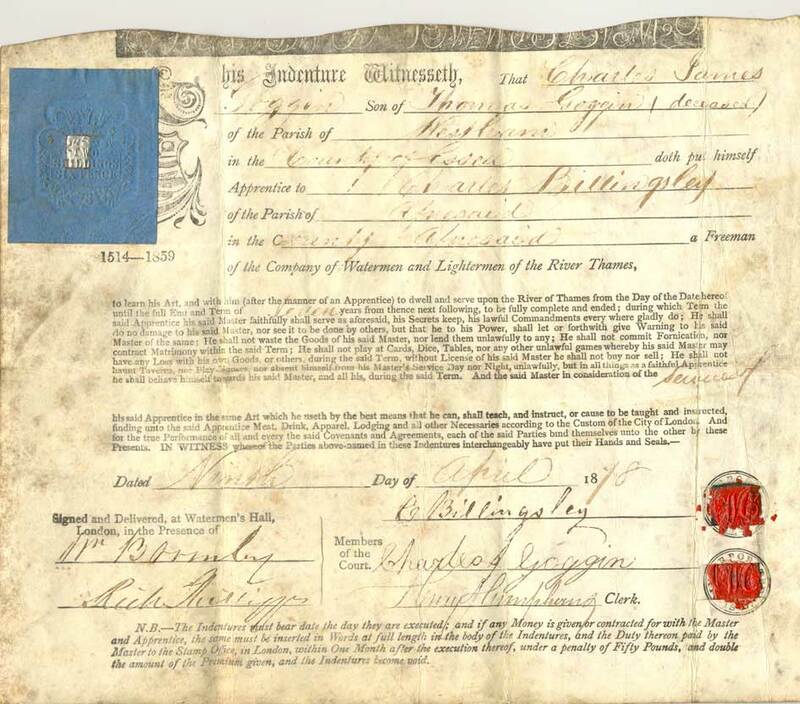 Charles James Goggin (born 1864) was taken on as an apprentice Lighterman by his Grandfather, a Charles Billingsley (b. 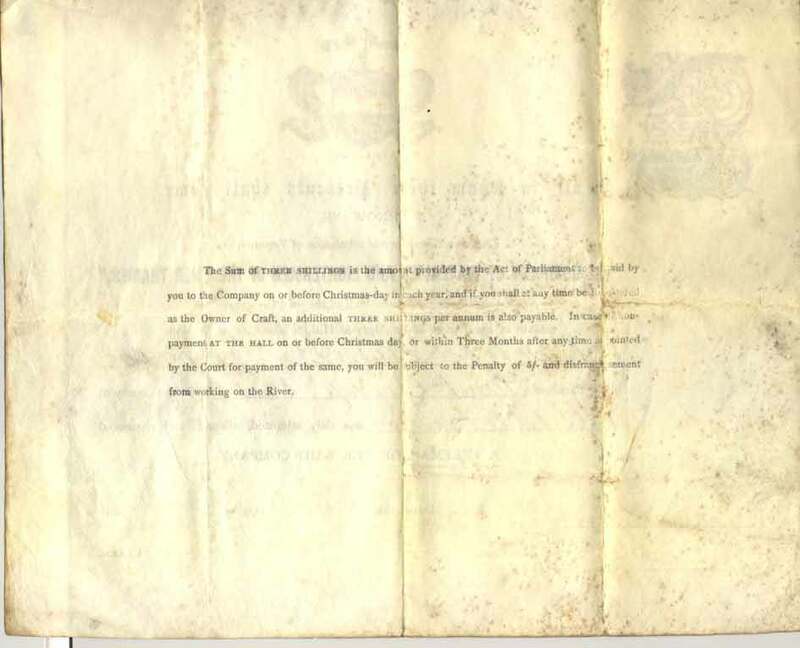 1815) as was his brother Thomas Goggin (b. 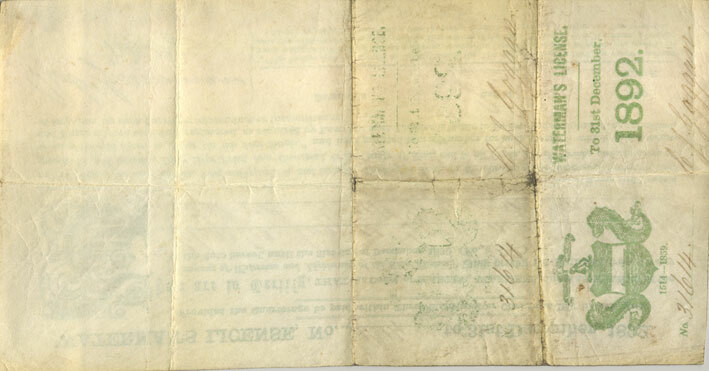 1866). 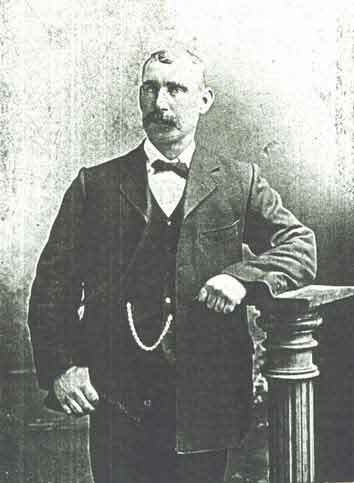 Their father, Thomas Goggin (b. 1839) was also a Lighterman but committed suicide by drowning at St Katherine's Dock, Whitechapel when Charles was only 9 years old. Charles' apprenticeship started on 9th April 1878 (it was usual for apprentices to start at the age of 14) at Stratford, under the master, his grandfather, Charles Billingsley. Apprenticeships lasted for seven years. The apprentice certificate was cut into two parts, one for the master and one for the apprentice. 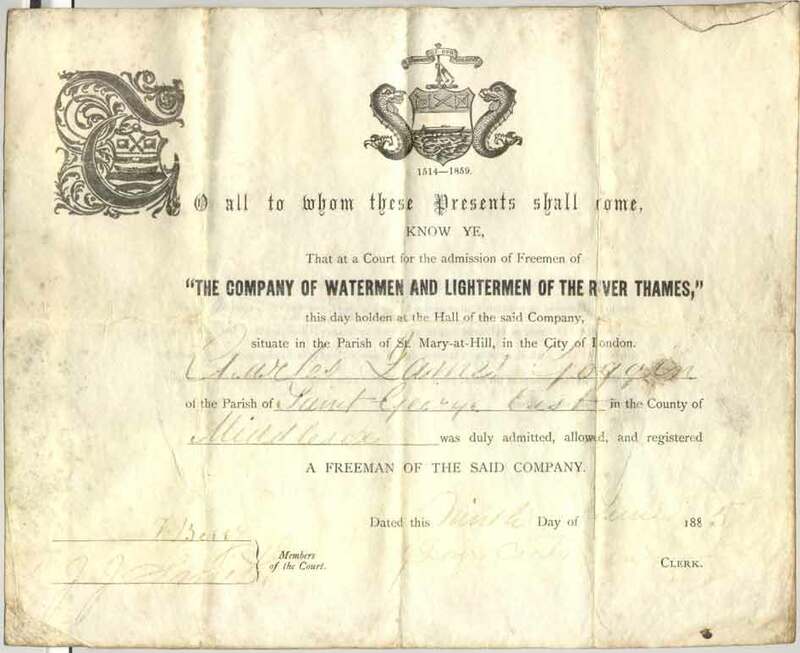 On 9th June 1885, Charles James Goggin was admitted as a Freeman of "The Company of Watermen and Lightermen of the River Thames". 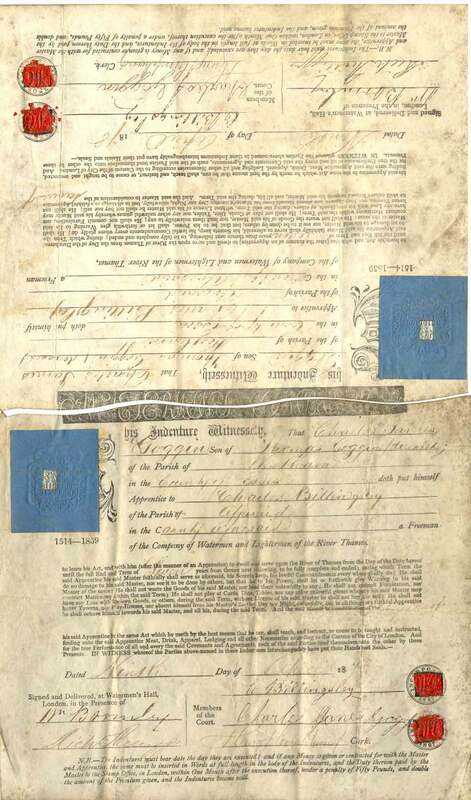 Apprentice Lighterman binding certificate, dated 9th April 1878, Stratford.